The phrase “I could juice that” is a constant in my mind these days. I bought our juicer to help my wife through a difficult food journey and, like the tool set I gave to her for Mother’s Day, I use it far more than she does. I have discovered that juicing is beautiful. I know that sounds ridiculous, but I am always impressed by the combination of flavors we are able to concoct. I love the improvising and the discovery. I love how good I feel and how clear-headed I am after I drink it. It really is life-changing. Juicing does, however, create a problem: what to do with all that juicer pulp? For those of you not familiar with juicing, the idea is that you can run your vegetables and fruits through this machine, squeezing the juice (which contains the vitamins and nutrients) into one container, while the fiber is separated into another. The juice is the nectar that goes into the glass, then onto the breakfast table. Yum! The pulp is typically discarded, or recycled in some way (this post has some great ideas of what to do with it). I had heard that juicer pulp is fantastic for baking because it still contains some of the original nutrients of the plant and it adds moisture to whatever it is being baked into. So, I set out to put together a breakfast that uses the stuff. 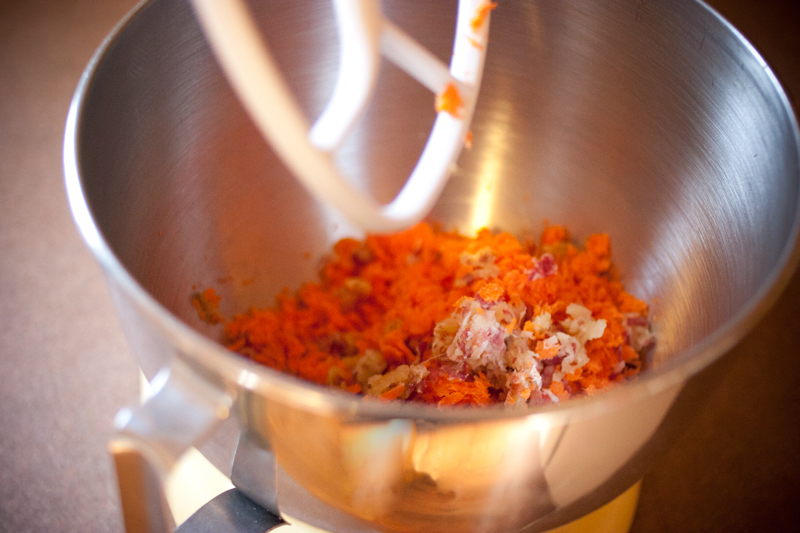 Carrots have become the main ingredient in our juice. High quality, organic carrots are inexpensive, sweet, and produce a lot of juice (carrots are typically about 87% water). Most of the nutrients are just below the skin so we like to wash them and put them straight through the juicer — no need for peeling. The list of health benefits is so long I am not going to attempt to list it here, but know this; carrots are really, really good for you. Their texture is “meaty” and they produce a lot of pulp. Because of this, I like to run the carrots through the juicer last to clean any apple skin or ginger fiber out of the juicer. Apples are, of course, good for you, but honestly we juice them for their fruity flavor. Our juicer is a masticating style juice extractor, which means it pushes the food through a tube using an auger and the juice is literally squeezed out of the fiber of the fruits or veggies. In this style of juicer apples have a tendency to get stuck in the auger. The simple fix is to run a carrot through after the apples to clean it out. Golden beets are added for their potassium, folic acid and iron. They are the preferred beet of our home thanks to their mild taste compared to the earthy flavor of their dark red cousins. Spinach is a miracle food. Like carrots, the list of health benefits is too lengthy to put here. However, the real miracle of spinach is that it has an extremely mild flavor that can be mixed into any juice. It’s an easy ingredient to add nutrients. Lemons give any juice a punch and hides the flavors of some of the more earthy vegetables. I was thrilled the day I realized I could put the entire lemon, rind and all, through the juicer to give it a zestier flavor. Like the apples, you will probably need to follow the lemon with a carrot to clean it out of the auger. Ginger is considered by many to be a super food, but honestly, we add it to our juice because it tastes amazing with the carrots. Honey can be added if you need to sweeten a bitter flavored juice. Beet greens can be added for additional nutrients, but you have to be conservative with them because they have a strong flavor. If you are planning to use the pulp for baking it is a good idea to separate beet green pulp out from the rest of the pulp so that you don’t end up with long fibers in your muffins. Juicing allows you to use whatever inspires you at the moment. There is really no need for a recipe and that’s the fun of it. On this particular Saturday these were the ingredients that made their way into our juice, and subsequently into our muffins. The juicing is the bulk of the work for this recipe. The muffins are easy. The juicer pulp and all of the ingredients are mixed in the mixer to create the batter. Simply blend and divide the muffin mix into 24 buttered muffin tins. I was feeling ambitious on this particular Saturday, so I added an optional filling inside the muffins. I used 1 cup frozen strawberries and 1 cup of frozen mangos. 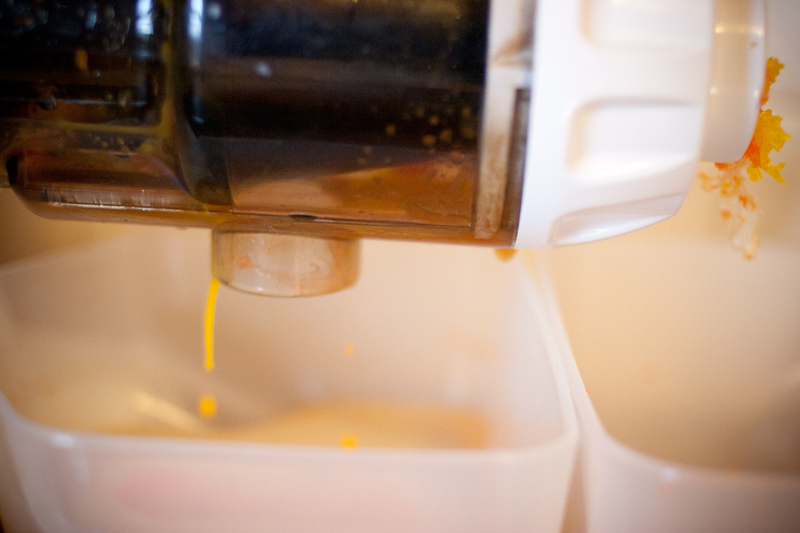 It was warmed at low heat on the stove with 1 TBSP honey to make it more syrupy. Then simply spoon it in to the middle of the muffins. 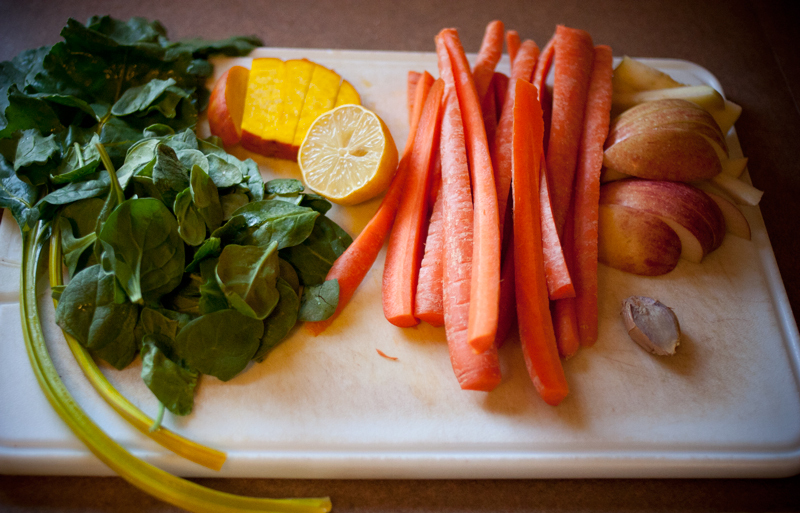 The color of our juice ended up as an earth tone due to mixing the greens with the orange of the carrot. Don’t be put off by this. It’s still delicious. 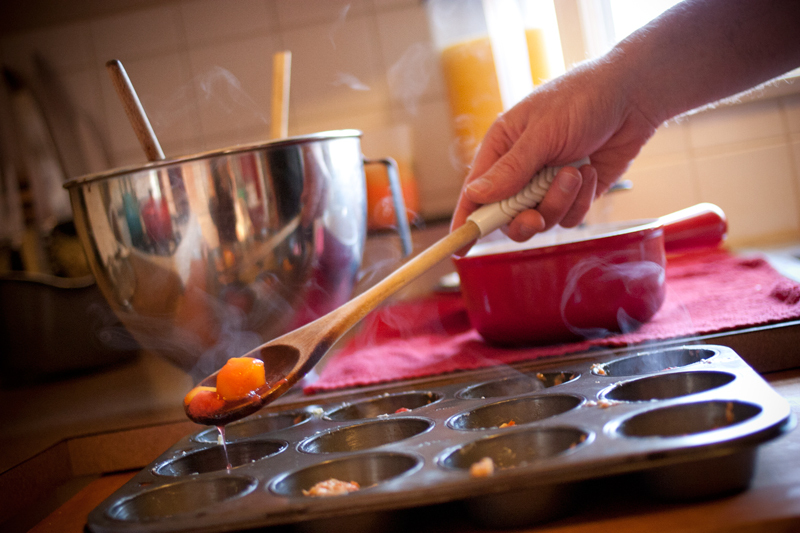 The muffins were excellent, and we felt great after having our veggies for breakfast. Every household has their own rhythms. Saturday morning has naturally become a time of gathering around the table for our family, probably because I love breakfast so much. On Saturday mornings we are excited about the leisure of the weekend ahead. On Saturday mornings we are looking forward to soccer games and projects in the garden. On Saturday mornings we have time to enjoy our breakfast. It’s unlike any other day of the week. I’ll be posting here what our family is doing on Saturday mornings in hopes of inspiring your breakfast table. Likewise, I want to hear from you. What do breakfasts look like at your home? Do you have suggestions of what we should try? I’d love to hear from you as we are always looking for new adventures. Can’t wait to try this!! Exactly what i’m looking for!! very yummy! I used carrot/grape/apple/pineapple pulp. I added 2 tsp of pure vanilla extract and a tbs of flaxseed and omitted the walnuts. came out delicious. Thank you for this great recipe! These are so good and easy to make! I love that there is no oil, and the real maple syrup for sweetener! Great job! I have been searching for recipe for pulp muffins and I am so happy I found yours. These muffins are so delicious, and I love that I can feel good about feeding them to my children. This recipe is my favorite. 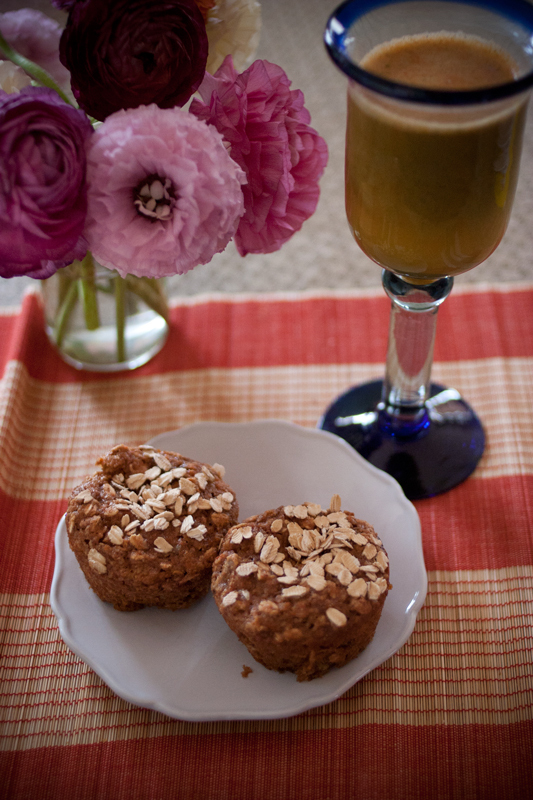 I’ve tried many, many pulp muffin recipes and this is by far the best. I’ve made these many times and will continue to do so. Adding in berries or fruit in the middle really sweetened it up. They get kinda icky if they sit for a couple days. The batter refrigerates well for several days too. I make these six muffins at a time and the batter seemed to last well for like three or four days. You can definitely taste it if it’s gone bad. I can’t throw away pulp in good conscience so I feed these muffins to my coworkers. They are fiber packed so watch how many you eat in one go. My coworkers seem to like them but they aren’t cupcakes but if you have friends who like to eat healthy, they do catch on!